If you are looking for diversity, Bethard is the place for you. It covers a wide range of sports and live betting options. Although it is relatively new, Bethard has managed to expand their community base, leaving the users satisfied. Take a look at the table below and read our Bethard review to find out more about the sportsbook. The welcome offer on Bethard will allow you to get several bonuses depending on how much you bet. The bonus consists of 5$ for every 100$ wagered. In total, you can collect up to $50. The minimum deposit required for the offer to become eligible is $20. Bethard is primarily sports-oriented, and it incorporates all of the most popular sports in the world on their offer. However, it is a European sportsbook which means that soccer is currently the most popular sports on the platform. Other sports included are tennis, basketball, ice hockey, handball, volleyball, e-sports, baseball, golf, snooker and pool, rugby, motor racing, darts, cycling, boxing, futsal, and many others. You might say the list goes on forever. It is exactly what makes Bethard exceptional – it is for avid sports fans, and you can bet on every sport you imagine. When you click on the “More Sports” button, you get sports such as Gaelic Hirling, and even Chess. There is just one small issue here – they should have included some markets that are not closely related to sports, as there are bettors who prefer betting on politics and entertainment. There is no doubt about it – the odds at Bethard are some of the best that you will stumble upon on the Internet. What makes them even better are the cool promos that follow them. For example, if you bet on Premier League, you will get a $2 return for every match your pick wins. Furthermore, there is a promo that boosts your winnings up to 30%, and all you need to do is to make a pre-match accumulator/combo bet. You can claim these promos with this Bethard promo code valid in 2019. Live betting is another section that the website pays a lot of attention to. Although the offer of sports is not as extensive as with the standard betting, the number of matches that are broadcast live is still large. There are very detailed statistics, especially when it comes to soccer. The betting is made easy, and there is a sort of visualization where you can follow what is going on in the field. However, there is no live stream option available for any of the sports. That is not a huge drawback as the website mainly focuses on the betting part. The Bethard management team probably does not think that live streaming is a necessary part of the live betting section. 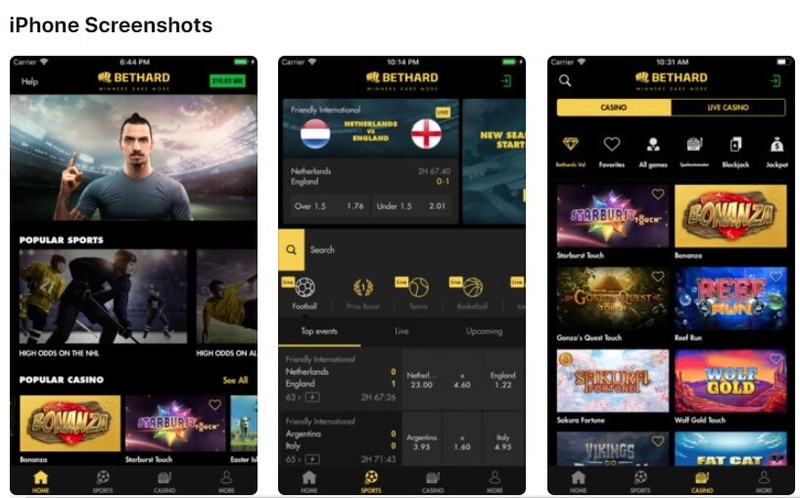 The team at Bethard did not want to follow the trend of only offering the browser-based app (which is the same website but optimized for mobile play). They understand the importance and flexibility of actually owning the app, hence their investments in the technology. The result is one cool application that you can download both for iOS and for Android devices. It has excellent loading times and includes the sportsbook, casino, and live casino. Apart from the impeccable functionality, the app actually brings the spirit of Bethard on mobile. It looks perfect, and the yellowish design fits the small screen perfectly. Bethard team did not give up on the idea of the mobile website and still managed to make that work great as well. Although only a few, payment options used on Bethard are some of the most popular ones, and you are likely to already use one of the methods listed below. The only thing you need to know is that there are safeguard fees that you have to pay if you use credit cards. Other methods do not come with fees, and all of them are almost instant when it comes to deposits. The currencies accepted on the website are Canadian Dollar, Euro, Swedish Krona, Norwegian Krona, and Swill Franc. Apart from the outstanding support team, they also offer the website in several languages, including English, Canadian English, Norwegian, Swedish, Finnish, and German. Finally, there is the detailed FAQ section, which has all the necessary details but could also be expanded more in the future. To sum up, Bethard is a great sportsbook that every sports betting fan will love. Apart from a few minor drawbacks, everything works flawlessly. The best thing is the number of sports that they offer – everything you love is there. You can use this Bethard review as a guide and claim the lucrative welcome offer that the website has. Just use the bonus code from this article, and you can enter the world of Bethard.